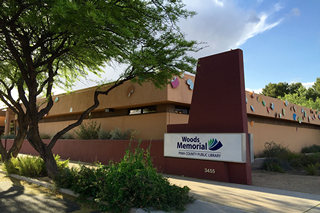 (TUCSON, Ariz.) – The Woods Memorial Library will be closed Wednesday, April 17–Sunday, May 5. We plan to reopen on Monday, May 6 at 10 am. During the closure, carpeting throughout the 16,650 square foot building will be removed and replaced. This includes its large and small meeting rooms and two study rooms. In addition to new carpet, the project also includes moving furniture to allow for the creation of an area designed for teens and tweens. The shifting of furniture will also make room for a prominent display of the Library’s Spanish language collection. The return book chute will remain open. Holds not picked up by April 16 will be held for one week after re-opening. Any items due during the closure will also be extended for one week. Items cannot be picked up at this location while the Library is closed. To renew items please call Infoline at (520) 791-4010 or visit our website at library.pima.gov. For more than 100 years, we have been here for people just like you. Today, in our libraries, online, or out in the community, our dedicated staff and volunteers are always looking ahead to help you find what you’re looking for. Every day, we’re making our mission a reality by educating and connecting people and inspiring ideas.